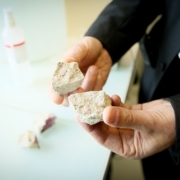 The FastCarb project (Accelerated carbonation of recycled concrete aggregate – www.fastcarb.fr) is the outcome of the coming together of two observations. First, the production of cement is a major source of global CO2 emissions, accounting for 5-7% of the total. Approximately two-thirds of these emissions are due to the decarbonation of limestone during the manufacture of Portland cement. The reversal of this process occurs naturally and is referred to as the carbonation of concrete. However, natural carbonation is a very slow process. Second, a large amount of the recycled concrete that comes from the deconstruction of buildings and structures is available, while natural resources must be conserved. Even if recycled concrete aggregate (RCA) can be used us such in concrete by adjusting the mixtures (see results of the French national project RECYBETON), it has higher porosity. This impacts the performance of recycled aggregate concrete, resulting in higher porosity, greater water absorption and slightly impaired mechanical performance. 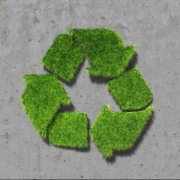 As a result, in order to use high recycling rates without losing the engineering properties required of concrete, it is necessary to increase the mixture’s binder content. Nevertheless, recycled aggregate contains portlandite and hydrated silicates which may be carbonated more rapidly than the concrete in structures. 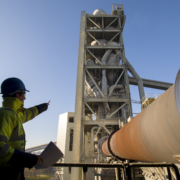 The goal of the FastCarb project, which has started in 2018, is thus to store CO2 in the RCA, while improving the quality of this aggregate by plugging the porosity and ultimately reducing the impact of the CO2 in the concrete contained in structures.